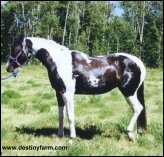 Rose is a Brown homozygous tobiano sporthorse type mare. 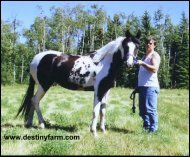 Her sire is a 3/4 pinto Arabian stallion - Ice-T. Ice-T has a excellent show record: Numerous First place, Weanling & Yearling Futurity winner, 3x National Champion Canadian Pinto Stallion, 2x National Champion English Pleasure(Basic Seat) & 2x Reserve National Champion Western Pleasure. 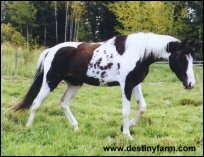 Rose's bottom side is Canadian Pinto Warmblood type mare CF Canadian Maid. Canadian Maid was Champion at the National pinto show as a weanling at halter but an injury the following year stopped her from showing. Canadian Maid has been inspected and passed by the Canadian Warmblood Horse Breeders association and she is a top producing mare. Her daughter CF Donner Maid went Inpection premium with the Canadian Warmblood Horse Breeders Association. 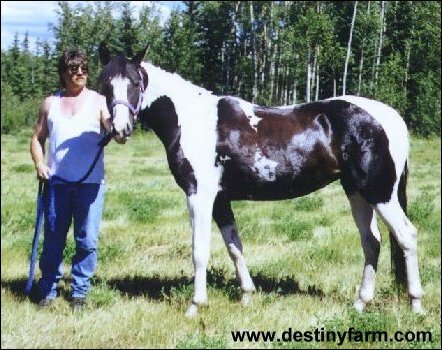 Rose was shown at the Alberta Pinto Horse Futurity on August 23, 1998 and she won her futurity class but has not been shown since. She has produced three lovely fillies and they can be seen on her offspring page. 2008 Region 17 Championships - Unanimous Champion HA Yearling Sweepstakes Filly. 2010 Canadian National Res Champion Futurity 1/2 Arabian filly(1 point shy of championship). 2010 Canadian National Top 10 Western Pleasure I sure we will be seeing a lot more of this filly in the winners circle in the future. Superstytion DF - Watch for the gelding in halter and western pleasure! MoonShyne DF - Pending - This colt is full sibling to Born to Shyne DF & Camera Shy.